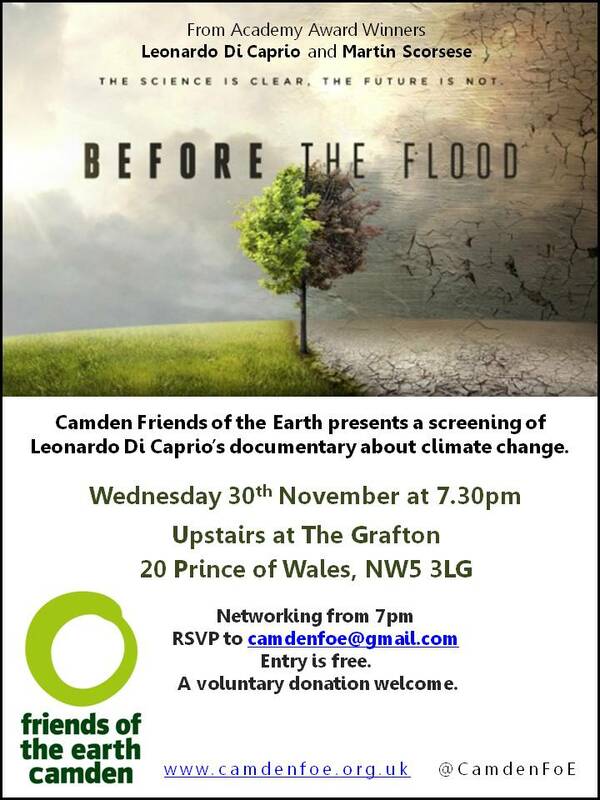 Camden Friends of the Earth will be screening Leonardo Di Caprio’s documentary about Climate Change ‘Before the Flood’, a must see production. Compelling and beautifully executed, the film explores the dynamics at play in the fight against global warming. The evening will also be an opportunity to socialise and network, so bring your friends and spread the word in your local group! The screening will be at 7.30pm. We will be there from 7pm. Entry is free but a voluntary donation to help us recoup the operational costs is welcome. Venue: The Grafton (first floor), 20 Prince of Wales Road, NW5 3LG.